Spoilers follow for The Walking Dead comics and TV show if you haven't yet watched episode five of season six, titled, "Now," and read all of the comics to date. In tonight's episode, Maggie dropped a bomb on Aaron, letting him know she is pregnant. Only one other person knows this fact, and it's Glenn. Of course, having a baby in the apocalypse has proven pretty problematic. On TV, Lori died at childbirth and in the comics she died with her baby as a single bullet shot through both her and Judith during a battle with the Governor. 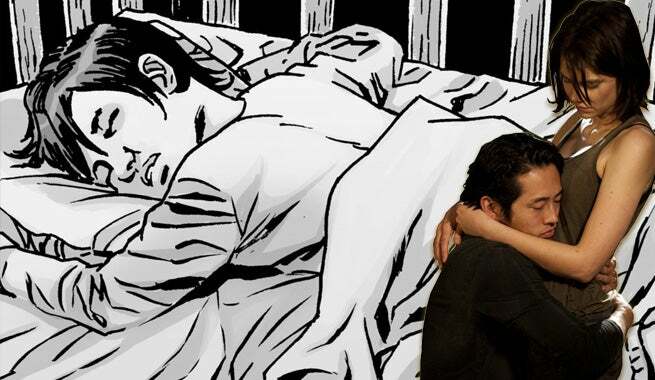 However, in the comics, Maggie's pregnancy goes much better than Lori's - at least so far. That's not to say Glenn is safe. Though Glenn didn't die at a dumpster in the comics, he doesn't make it to see the child born, either. When Maggie is a few months pregnant, a caravan of Negan and his Saviors stops a van filled with Rick, Maggie, Michonne, Carl, and Glenn. After a game of eenie-meenie-minie-mo, Glenn is chosen as Negan's victim and promptly has his head bashed in by Negan's Louisville Slugger, whom he likes to call Lucille. A war ensued between Rick's band of survivors and Negan's band of crazies, but ultimately a peace was found before a two-year time jump. Sometime during the jump, Maggie birthed her baby, who she named Hershel, in memory of her fallen father. To this day, Maggie and baby Hershel are still alive in the comics.